7 great SEO tips to market your start up business that you may not already be doing. 7 SEO Tips For Marketing Your Start-up Business. 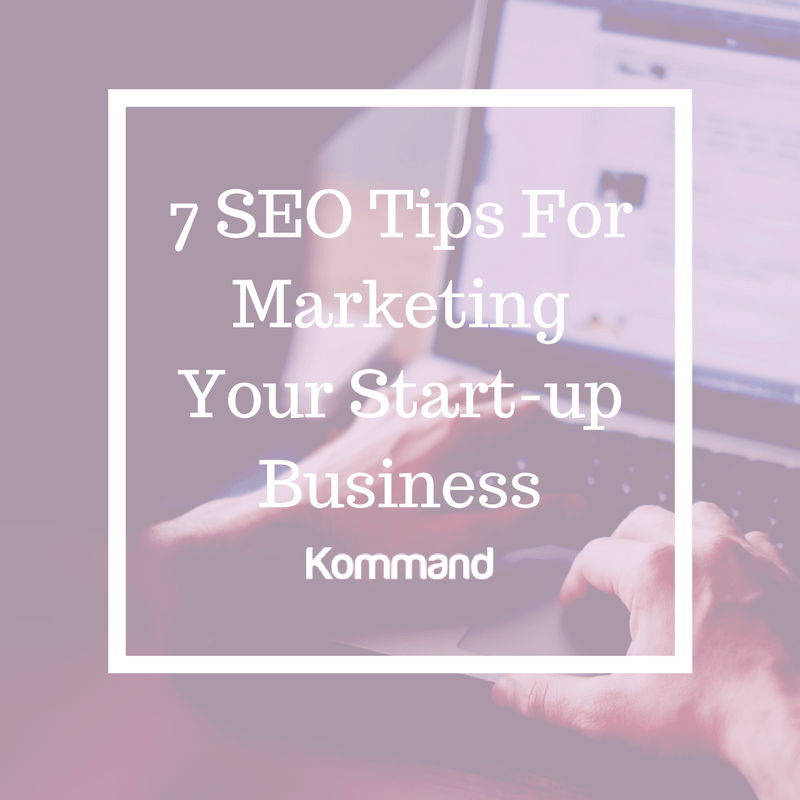 Here at Kommand we have put together a small blog post based around some seo tips and tricks you should follow and pick up on to market your start up business. All proper SEO research starts with target keywords. Based on your demographic and an in-depth analysis of current and recent search trends you can easily determine the keywords that have the most return with the least competition. What you’re going for here is trying to get your readers interested in your content, and as any content marketer will tell you, it’s the first step towards building a rapport with your audience. Creative Director for Avila Web Firm, Dan Steiner is noted as saying, “Mobile friendly is becoming the new standard, as was made apparent by Google’s latest update. Most folks think that they need to completely re-do their websites, which is just simply not the case. There are plenty of resources online that can convert websites to mobile-friendly standards, without breaking the bank.” Even if budget is your concern, you have far more to lose from a site that isn’t mobile compatible than you save from not making it mobile compatible. Creating content to market a startup means making a connection with your target audience. Keeping it simple is the best way to get information across to someone who isn’t an industry expert. Ideally, your content should be simple enough so that someone with no background in your field would have no problem understanding what it says. Although social media marketing is only a subset of digital marketing it is very important especially for startups. A social media campaign can help promote your business to the local market and raise the awareness about your products or services. If you don’t plan on hiring a professional team to handle your social media campaigns, then the best way is to decide which platform (Facebook, twitter, Google+, Pinterest, LinkedIn, etc) is more appropriate to your business and concentrate on that. Try to participate in discussions related to your niche, connect with your users and give them incentives, through the sharing of quality information, to connect with your business website. Create content that can be read by search engines. Your website needs to have content as well – Try to find what keywords (Hint: You can use the Google keyword tool) normal people may use to find your business and create relevant and high quality content. Content can be in any form (video, audio, info-graphic, images, presentation, etc) but when published on the website it has to be accompanied by text as well. There is a tendency for small business or startups to create fancy websites with lots of images, videos, animations and flash. The problem with such websites is that if they are not developed correctly they are too slow to load and they are not easily understood by search engines. This is not good for SEO or for a good user experience.